One student each in the Brentwood, Herricks, Jericho, Roslyn and Syosset school districts qualifies for at least $25,000 in prize money. Five public high schools on Long Island produced finalists Wednesday in the national Regeneron Science Talent Search competition, including one 12th-grader who researched erosion of local salt marshes and another who ignited rocket engines in the parking lot of his father's contracting firm. The districts of Brentwood, Herricks, Jericho, Roslyn and Syosset claimed one winner each in the 77-year-old contest. They are among 40 finalists nationwide qualifying for $25,000 each in prize money, along with a chance to win a top award of $250,000. Finalists will travel to Washington, D.C., in March, where they will compete before panels of expert judges for more than $1.8 million in total awards. The winners were selected from 300 semifinalist scholars announced this month, and a total applicant pool of nearly 2,000. Regeneron Pharmaceuticals Inc., a biopharmaceutical firm in Tarrytown, funds the contest. As usual, New York State led the country in finalists with a total of nine, more than half of whom live in Nassau and Suffolk counties. California ranked second with eight finalists, while Maryland and Virginia tied for third with three finalists each. Top-achieving schools nationwide this year, with three finalists each, were Montgomery Blair High School, which is public and located in a Maryland suburb of Washington, D.C., and The Harker School, which is private and located in California's Silicon Valley. Regeneron winners typically spend weeks or even months in university laboratories, working closely with adult faculty. 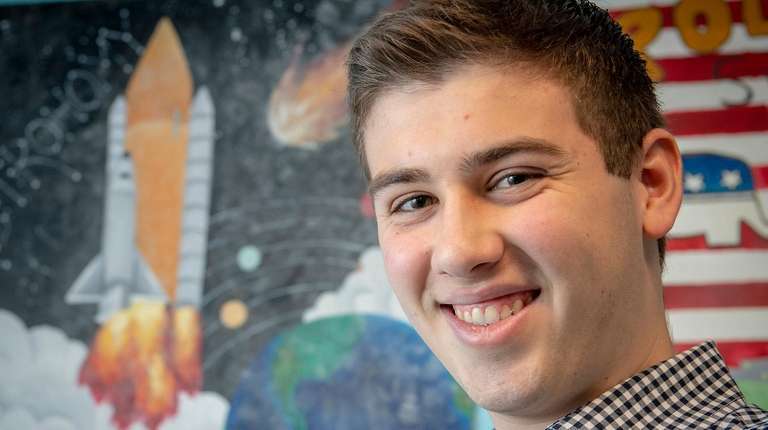 Justin Schiavo, 18, of Roslyn took a different approach, experimenting with rocket exhaust nozzles at the headquarters of his father's heating and air-conditioning business in Woodbury. Schiavo's goal was to develop parts for an inexpensive hybrid rocket engine, one that would make space travel more affordable. This meant building from scratch a rocket engine powered by highly combustible fuels. “Any scientist you contact, they’re not going to want to do something that could endanger you,” said Schiavo, who displayed two of his heat-resistant copper nozzles Wednesday in a third-floor research center at Roslyn High School. For safety's sake, Schiavo fired his rocket engines on the grounds of his father's firm. The project was approved in advance by a school review committee, per contest regulations. Allyson Weseley, coordinator of secondary research at Roslyn High and a mentor to multiple winners over the years, saluted Schiavo's homegrown approach to scientific exploration. "Justin is such a great kid with such an all-encompassing love of rocketry," Weseley said. "It's not like they put him in a lab — it was his baby all the way." Contest officials privately notified finalists of their success Tuesday, in advance of Wednesday's public announcement. It's an annual ritual that generates excitement on the Island, as competing schools await results. "That is fabulous news!" said Thomas Rogers, superintendent of Syosset schools, after getting the news that a local senior, Thomas Lam, 17, made the finals. Justin Schiavo, Roslyn High School Photo Credit: Newsday/J. Conrad Williams Jr.
Lam's math project involved a sliding puzzle with 64 pieces, all rotating simultaneously. 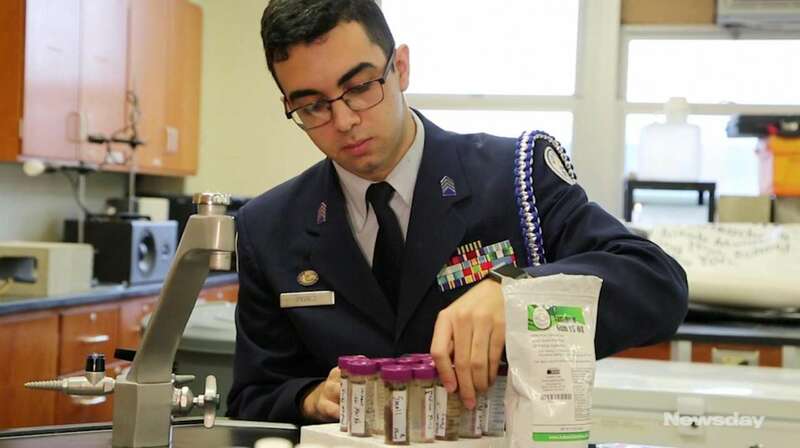 Brentwood's Ahmad Perez, 17, captured honors with a project that examined the degradation over time of two Island salt marshes — Crab Meadow in Northport and Timber Point in Great River — and presented a method of restoration. Mentoring was provided by Rebecca Grella, Brentwood's science research director, and Sherif Abdelaziz, an assistant professor in civil engineering at Stony Brook University. Perez's win was a morale booster for his community, where 88 percent of students are counted as economically disadvantaged. "It really doesn't matter what obstacles you face if you push forward with character, integrity and humility," Grella said. "We've faced stigma as an underdog, but we rise above that." The other two Long Island finalists are Eish Maheshwari, 16, of Herricks High School and Madhav Subramanian, 18, of Jericho Senior High School. Project Summary: Lam’s math research determined the kinds of rectangular number rotation puzzles of any size that are solvable and developed an algorithm that generates the moves necessary to solve them. Project Summary: Maheshwari explored the viability of binding drug-loaded nanoparticles to red blood cells to deliver drugs that may otherwise miss their targets or be metabolized by the liver. Project Summary: Perez researched the erosion of salt marshes, a growing global problem, to determine how they may be influenced by nutrient levels. He also investigated soil additives that could be used to enhance salt-marsh restoration. Project Summary: Schiavo designed and built a new type of nozzle for an inexpensive hybrid rocket engine, improving thrust with the goal of making space travel more affordable for more people. 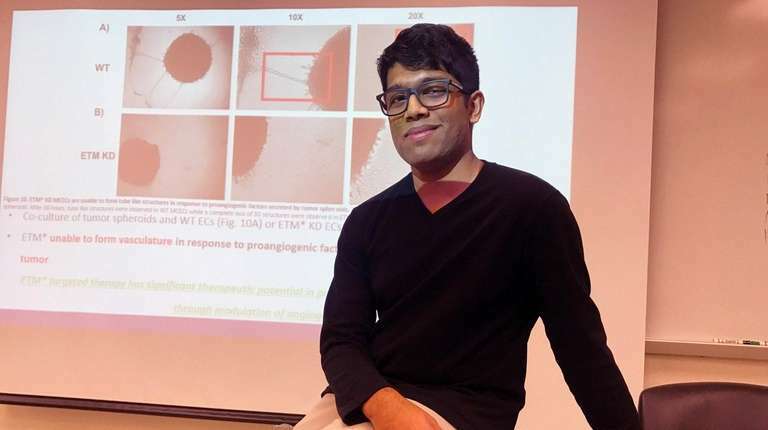 Project Summary: Subramanian studied the formation of new blood vessels, called angiogenesis, and how enzymatically regulating this self-repair mechanism might stifle the spread and growth of cancer tumors. 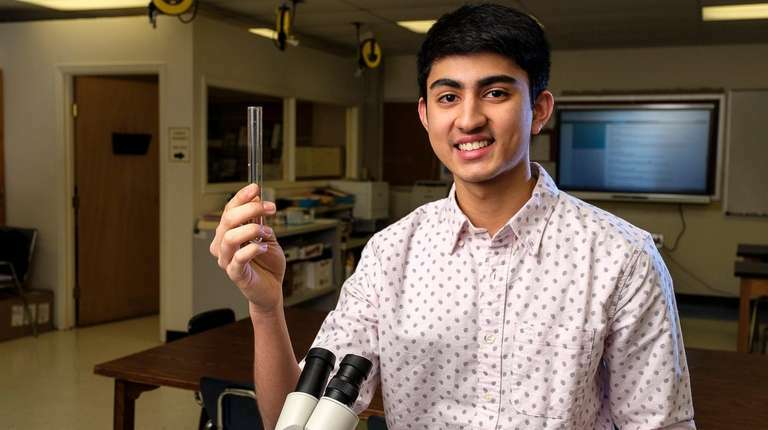 Meet LI's Regeneron honorees and their projectsLong Island is home to five finalists, among 40 in the nation, in the Regeneron Science Talent Search.